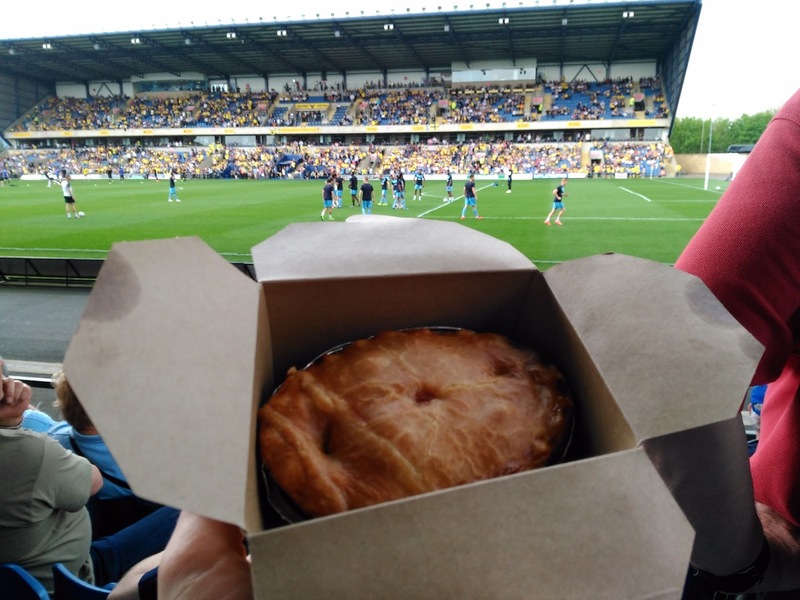 continue reading "We bet you'll want to feedback on football pies!" 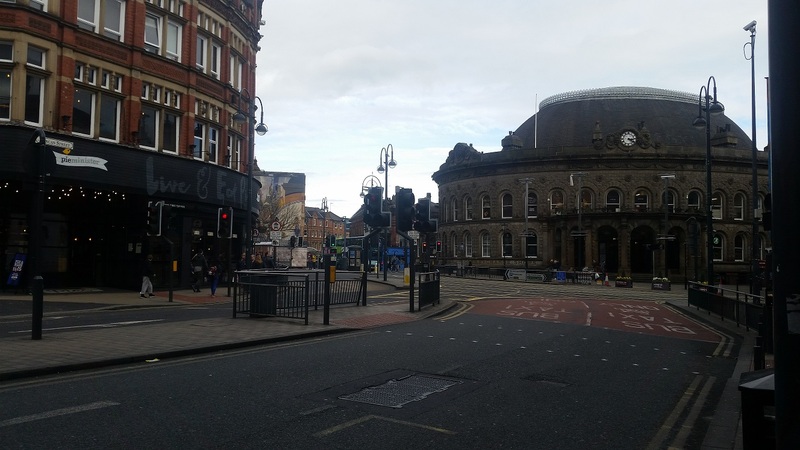 This year, as part of our Pie Pledges for British Pie Week, we decided to head up to Leeds Leeds Leeds to do a #LeedsPieTour! As part of the Leeds Pie Tour we went to a pub in the rejuvenated Granary Wharf in the centre of Leeds. The Hop is one of those trendy types of places built into the archway of the old railway. When doing our research into Leeds pies we were fairly staggered by what we read. Apparently they offered a Pie, Mash, Peas/Beans, Gravy AND a Pint for ONLY A FIVER! Yes, things are cheaper than we are used to down South but surely this kind of offer was impossible. We went in, expecting some kind of catch, we even had to clarify with the guy on the bar, but yes, it was true. He claimed they could offer it cheaper because it is their house beer. 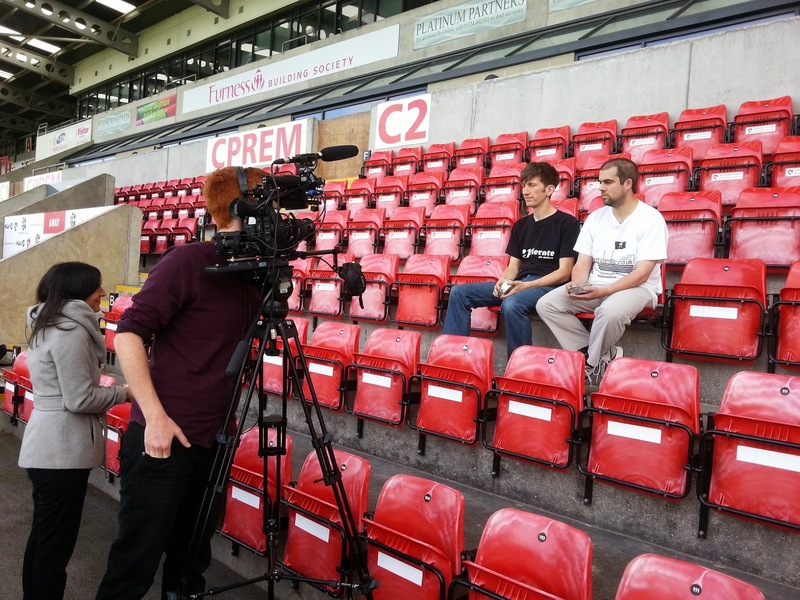 But still, surely the pies must be ASDA Smart Price in order for them to make any money at all? We started to understand the business model once we had placed our orders. 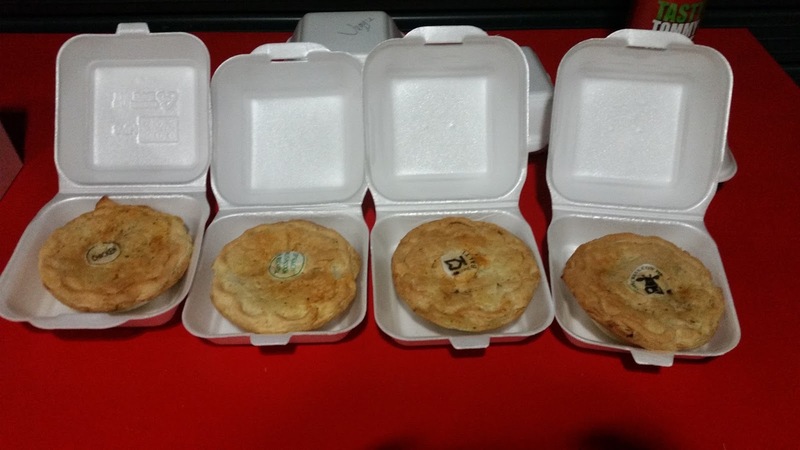 The pies are already cooked and they operate more of a take-away type of systems. There is a hatch (the eponymous Pi Hole) where you pick up your order once it is ready. The meal comes in a biodegradable box with wooden cutlery. 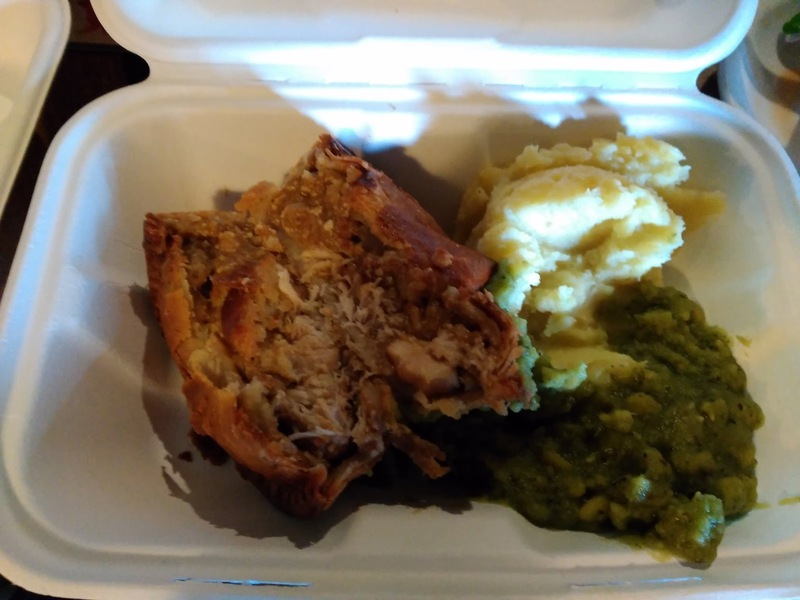 It is a bit of an odd situation to then eat your take away pie in the pub but it seemed to work. The pub primarily focuses on providing real ale, with the food more of a convenient accompaniment rather than their primary focus. 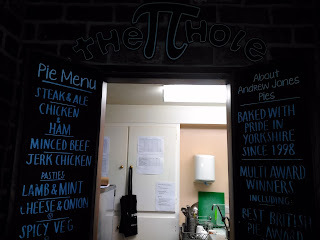 We learnt that the pies are supplied by Andrew Jones Pies of Huddersfield, a company we had not come across before. There were a wealth of options, we tried to trick Pierateer RAS into getting a Lamb pasty but sadly he decided he wasn't hungry after what had already been a pie filled weekend. Pierateer SJL opted for the Chicken Balti while Pierateer TJP went for the classic Steak & Ale. At first glance they did actually look pretty appealing. 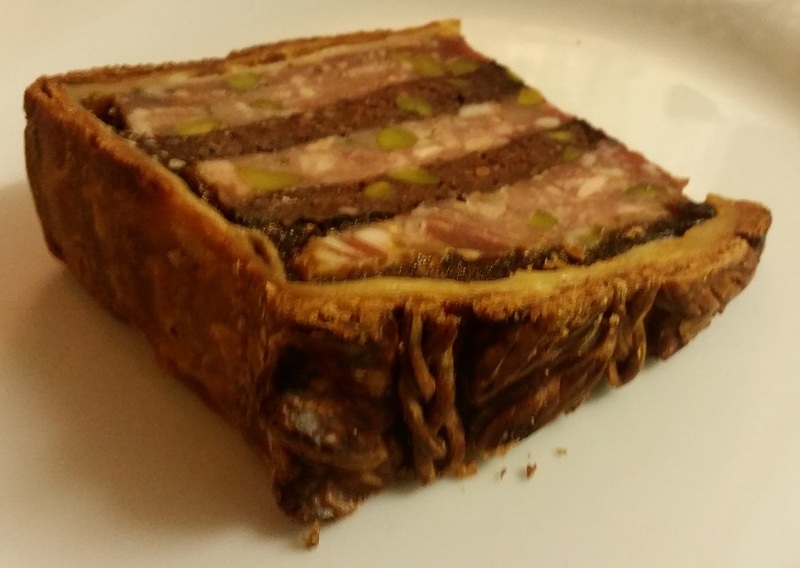 Stout and solid shortcrust pastry had been used. The glaze was something I could have gazed at for days. It was brown and lustrous, indicating tasty pastry. Surely these would be empty promises as I expected this to be a typical half filled mass produced pies? But no, yet, again, these pies surprised us because they were well filled. The Chicken Balti in particular had been packed with meat rather than sauce or air. The Steak & Ale was a bit more heavy on the meat flavoured sauce but still found space for a satisfying amount of meat. 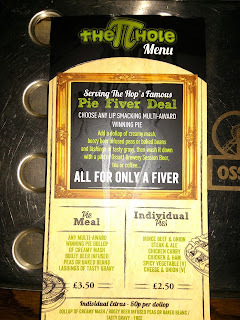 My pie meal for a fiver kept me satisfied all the way back to Gloucester. For both pies, the shortcrust pastry was tasty and crunchy on top although some parts on the bottom were slightly soggy. The meat chunks in the Chicken Balti were quite big and satisfying, they didn't have the watery texture that some mass produced chicken chunks have but yet they avoided being dry. 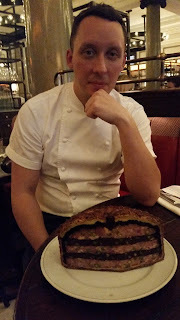 The texture of the steak was tender, perhaps a bit too soft if anything, a bit like steak from a tin. Onto the flavour and whilst we kept looking for ways in which these pies were going to let us down, yet again they surprised us being enjoyable and full of flavour. The Chicken Balti was quite spicy, perhaps a bit too hot for some but was anything but bland. 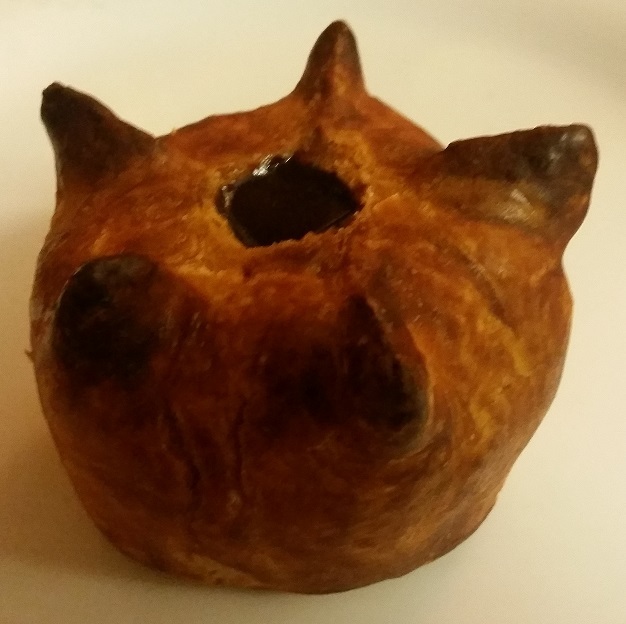 The spicy marinade was not quite like any other Balti I pie I had tried before. I really enjoyed the flavour, so much so that I bought another to take home. 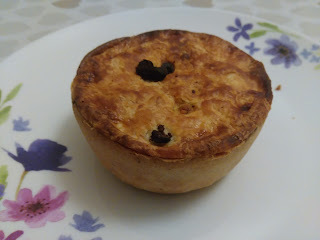 The Steak & Ale was a bit more traditional, it captured the classic Steak & Ale pie flavour well although didn't do anything spectacular. The main downside was that the flavour was dominated by salt a bit too much. Whilst Pierateer TJP tried this pie in the restaurant, I also purchased one to take away so I could verify it was a very good pie. However, in this case, it was the Chicken Balti that really stood out. 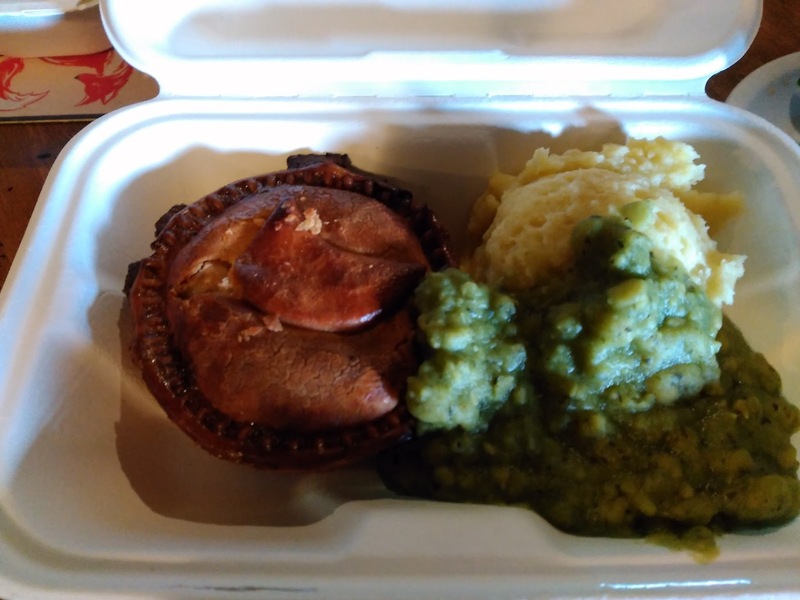 continue reading "Leeds Pie Tour: Hop to the Pie Hole"
continue reading "Meet the Pie-ducer: Calum from Holborn Dining London"
continue reading "Leeds Pie Tour: Insect Pie!" 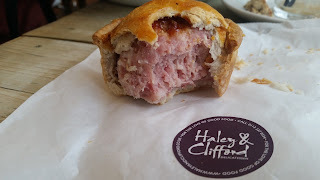 continue reading "Leeds Pie Tour: Voakes Pork Pie at Haley and Clifford"
continue reading "Leeds Pie Tour Video"